Experience the revolutionary design of Zune HD. With HD Radio, wireless syncing and enough space for all of your digital media, the 32GB Zune HD combines feature-rich capabilities with the convenience your mobile life demands. The multi-touch screen and OLED display gives you instant access to your media in a vibrant 16:9 aspect so your view is never obstructed. The brushed platinum finish will make you the center of attention wherever you go. Listen to crystal clear HD radio with the integrated receiver and tune in to your favorite stations at no extra cost. Hear something you like and buy it immediately or tag it for a later purchase. 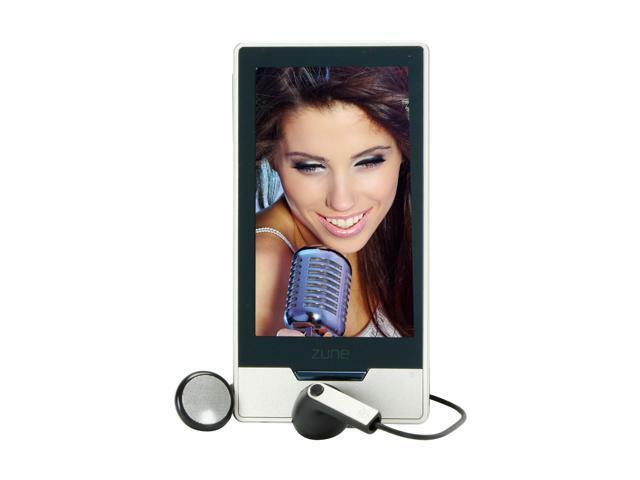 With wireless connectivity at any Wi-Fi hot spot, you can stream millions of songs and turn your Zune into a mobile jukebox or update and buy content at any time. Surf the web with a full-featured Web browser, tap-to-zoom technology and a virtual QWERTY keyboard. Your Zune HD can also be a portable movie player for watching your favorite videos on the spacious 3.3-inch display. Use the separately sold AV dock and watch your HD films, shows and videos in 720p high definition on any HDTV. With more of the content you demand like sports, news and music from around the world, the Microsoft Zune HD could be the single solution to your mobile digital life. Redefine your world in high definition today! 3.3-inch Touchscreen The Microsoft Zune HD features a 3.3-inch multi-touch screen based on a vivid 16:9 OLED panel for comfortable movie watching, picture viewing and convenient menu navigation. 32GB Storage Capacity With an ultra-large 32GB storage capacity, the Microsoft Zune HD stores up to 10 hours of HD videos, or 48 hours of SD videos, or 8,000 songs, or 25,000 photos, perfect for building up a complete media collection. HD Radio Compatible With the Microsoft Zune HD, experience crystal-clear, static-free broadcasting, advanced data services and much more from your local HD Radio stations. Wi-Fi Wireless Connectivity With built-in Wi-Fi capability, the Microsoft Zune HD supports wireless access to Zune music store, Internet browsing and more. HD Video Output Place the Microsoft Zune HD to the AV dock (sold separately), now you can watch your HD movies, TV shows and videos in 720p high definition on any HDTV. Windows Media Video (WMV) (.wmv) – Main and Simple Profile, CBR or VBR, up to 10.0 Mbps peak video bit rate; 720 pixels x 480 pixels up to 30 frames per second (or 720 pixels x 576 pixels up to 25 frames per second). Advanced Profile up to L2, 1280x720 up to 30 frames per second, CBR or VBR, up to 14.0 Mbps peak video bitrate. Zune software will transcode HD WMV files above stated capabilities at device sync. MPEG-4 (MP4/M4V) (.mp4) Part 2 video – Simple Profile up to 4.0 Mbps peak video bit rate; 720 pixels x 480 pixels up to 30 frames per second (or 720 pixels x 576 pixels up to 25 frames per second). Zune software will transcode HD MPEG-4 files at device sync. H.264 video – Baseline Profile + bframes, up to 10 Mbps peak video bit rate; 720 pixels x 480 pixels up to 30 frames per second (or 720 pixels x 576 pixels up to 25 frames per second). 1280x720 up to 30 frames per second, up to Level 3.1 and 14.0 Mbps peak video bitrate. Zune software will transcode HD WMV files above stated capabilities at device sync. DVR-MS – Zune software will transcode at time of sync. Cons: The only bad part of the Zune, is that if something happens to go wrong, you have to talk to India...The screen's glare is pretty bad, but then again if you aren't playing apps, why are you looking at the screen? Pros: It is incredibly light, looks great, has phenomenal battery life, and has an amazing warranty. The warranty isn't even necessary, though , because the product is extremely durable and with the tegra processor, the games are extremely high quality and the zune can take the demands. Loading time and lag are minimal and the built in EQ makes for great hearing through almost any ear/headphone. There's a reason I've stuck with microsoft for the zune from 1st gen to now. Cons: rarely freezes up, but nothing a reboot and re-sync with the computer can't fix. does have a somewhat lengthy loading time for some games and movies. Other Thoughts: Very sleek and nice layout, love the edges and overall design of it. The rubberized bottom makes it easy to grip when gaming if you don't have a cover and the looks and OLED screen.... well, it's nothing to joke about. Bravo Microsoft. A near flawless device. Pros: I have an iPod Touch 4G. I really like the iPod, but the Zune is great. Kudos to Newegg for getting the Zune to me within 3 days. I pretty much only shop with them. Cons: Of course, the included ear-buds are bad But so do any ear-buds from Apple. I'm usually good about figuring stuff out, but there is a learning curve with the Zune software and hardware. Not a big deal. Other Thoughts: I really like the Zune a lot. Pair it up with good buds or headphones and you should be very happy. Just expect to learn some stuff. It won't be hard. Pros: The price. Whether here or at another retailer. Shop around! Display is very nice. The OLED screen is excellent albeit the resolution is a bit low for today's standards. I actually like the interface. Takes a little bit getting used to but once you do it works very nicely. Some people like it, others don't; to each their own. Excellent battery life for such a device. At 32GB capacity, plenty of room for pictures, videos and music. Cons: Forced to use Zune software (Apple forces you to use iTunes). It's a bit clunky in my opinion but is manageable. Does not show up as an external drive in Windows explorer. Another proprietary connection (also like Apple). It's 2011 and no can agree on a standard for all MP3 devices? Very few apps. Not a big deal if you're not into that sort of thing. The internet function is okay but nothing to write home about. The device settings are not very customizable. Other Thoughts: I bought this at a B&M store for the same price (device only). I also got 5 screen protectors, a carrying case and a tdual usb wall charger for $250 WITH tax. Not knocking Newegg on this but prices have come down a lot being this device was launched in 2009. Now with Microsoft (MS) announcing the Zune (hardware, not software) will most likely be discontinued, prices should slowly drop over time and will be combined with other accessories since retailers will be looking to reduce their inventory. MS originally wanted to take market share from the Ipod but they did a very poor job of it. As I said earlier, this device debuted in 2009. How many Ipods has Apple come out with since then? MS didn't put much thought into this. BOTTOM LINE: If you're looking for a decent MP3, picture and video player, this is an excellent (and cheaper) alternative to the iTouch. If you are more into apps, internet, bells and whistles go for the Itouch instead. Cons: Have not found any yet. Pros: The PMP has a great design (nice little touches like the Seattle remark on the side) and a great UI. Cons: I just wish car stereo decks worked with it via the USB cable. Pros: The Zune HD is an excellent device for playing Music and Videos. Its OLED screen is simply amazing in my opinion, the colors and contrast ratio it produces are outstanding. It has decently fast hardware with an ARM CPU clocked at 600MHz and 128MB of SDRAM. It is very inexpensive compared to its competitors at the same capacity. Its HD output is perhaps surprisingly, very fluid. Its touchscreen is very smooth to slide your finger/thumb across and is very responsive. The user interface is very fluid, fast and elegant. It is extremely durable with an aluminium body and gorilla glass screen. Pros: this thing looks to be king for media use. My daughter needs to have something to use as a tool (in media work) and hands down decided on this. Other Thoughts: but absolutely blows it out of the water in others. I have an iTouch and ABSOLUTELY enjoy it. Purely media though... the OLED screen, interface, ZunePass (and specific strengths) has me getting one of these for my daughter. I am not a "fanboy" but there is no comparison, and think that Apples mid range player, should take a HUGE back seat to the smaller 16GB Zune HD. (Look and see for yourself.) Looking forward to checking this out with my daughter and ordering one up soon.